The web video platform for professionals, beginners and everyone in-between. Upload your video, customize settings and create limitless copies with different settings for sharing in different environments. All this accomplished with click and choose video files from your hard drive or existing online collection, as URLs are also compatible with the system. Your VODs (uploaded Videos on Demand) and your auto-archived live streams automatically generate unique and secure sharing URLs and codes for deploying directly to your web site, your customer's web site, social media, emails—wherever you need them. Don't have a web site? No problem, the QuickView share URL creates a stand alone web page just for that video, or an entire Channel of videos that can be viewed by anyone with an Internet connection, anywhere on the globe. All your videos, channels and advertisement CtAs (Call-to-Actions) are controlled from one handy dashboard. Onscreen player gadgets, player commands, like page forwarding or open in new page, or chain forwarding from video to video for sequential sharing of a series, all can be managed from one central location. This EZ control is used throughout the admin. console. Anyone on your staff can do this. 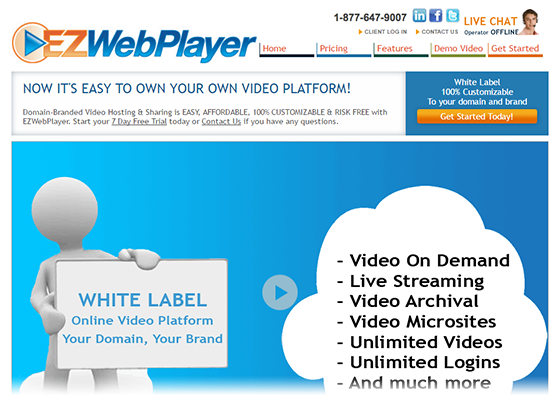 Through the years, EZWebPlayer has been a cutting edge feature creator for the streaming industry. Below is our timeline of successful development to date. By late 2007 Clint Pollock had been running Adventure-Crew, Inc for a few years. We were tasked to visit/film each USA based national park and create press packets for them to be hosted on Adventure-Crew.com. He quickly came to the conclusion that we needed a better way to deliver our video assets to our audience and thus EZWebPlayer was born. By 2009 we launched our site with 2 downloadable players that you could edit. One was meant for a single video and the other was meant for a playlist of videos. By 2011 We joined up with Sibers.com and created our back end admin console, allowing customers to login and manage their players on the fly. No more coding needed for our customers. Until this time, industry standard video hosting had been a metered bandwidth product. Users had no choice but to pay bandwidth usage charges on top of the flat fee for premium hosting features. 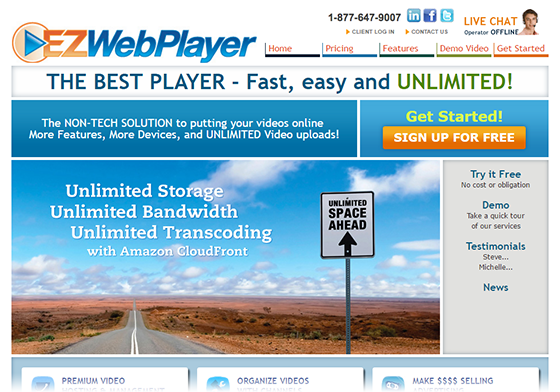 EZWebPlayer changed all that and to this date is still the leader in non-metered web video hosting. Customers pay just one fee, no extra bandwidth charge. By offering planned usage platforms to fit the customer's needs, EZWebPlayer takes on the gamble of metered bandwidth while freeing the customer of that second bandwidth worry— no more bandwidth bills. Unlimited means unlimited. We added live streaming and video transcoding allowing us to support hundreds of video formats. Live streaming was just coming into "household word" status and EZWebPlayer was the first to offer the branded live stream to small and medium sized businesses as well as the not-for-profit, like churches and municipalities. Today, EZWebPlayer is the home to many branded live streams for the American church, as well as world wide church worship, worship centers and global outreach, including both Christian and non-Christian religiouns— facilitated by our affiliation with Amazon Web Services with Cloud nodes all over the globe. Villages, towns and cities use EZWebPlayer's live stream and auto archiving for municipal meetings and town hall broadcasts. One of the largest users of EZWebPlayer's branded live streaming is the largest Los Angeles, California service host of red carpet events of the Hollywood industry for film and television, Streaming Media Live, owned and operated by our long time customer, David Simpson. In 2013 we started creating our white label options allowing the customer to brand the admin console as their own product, and published this new, industry-breaking feature in 2014. Our product offering broke directly upstream against the lion's share of the streaming hosts that demanded that their big names be attached to you the customer's content with watermarks and outright name graphics on the player window. 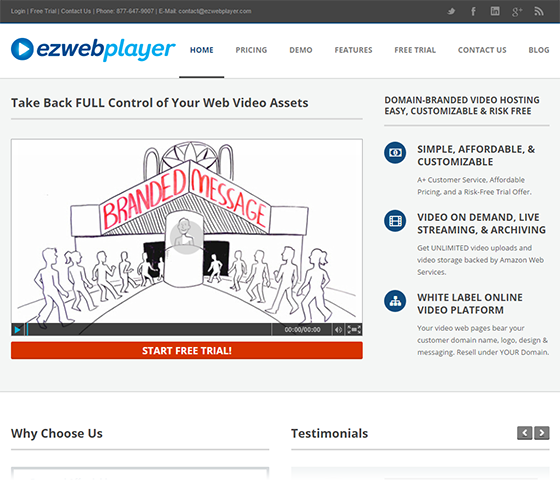 EZWebPlayer hands back that rightful real estate for premium services to the customer who is paying for it. We feel that if you are paying for that premium web real estate, you should be able to go to someone who provides that service. Today, the leaders in the industry are finally taking our lead and offering white label branding. In 2015 We released our ultimate account level, calling it White Label Custom, allowing customers to create sub accounts and resell video hosting as their own solution. From the Eastern seaboard of America to the western US and beyond into Europe and the eastern nations, EZWebPlayer hosts branded streaming media for a broad spectrum of content that includes football/soccer matches all over the globe, local little league games in home town USA, educational, worship and commercial content in both live and archived streams. Watch any European football/soccer lately? Chances are good that many of these matches are carried over a custom branded EZWebPlayer portal; from the source, directly to your device. And, since the release of our affordable branded live streaming player, even many of the live matches are watched on our Players. We keep a pretty close eye on our industry, and to date, EZWebPlayer is still the only web video and live streaming host that offers D.i.Y. branding and ownership of the hosted real estate with a feature rich tool set at affordable pricing. Before EZWebPlayer, there were only two main choices for the streaming media community; 1) over-priced, commercial, web video hosting and 2) free You Tube. 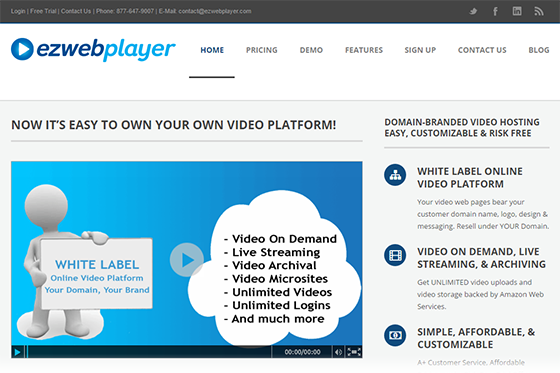 Now, EZWebPlayer has forced the industry to recognize that it is the small to medium business owners and operators who actually drive the web video hosting industry, not just the "big boys". The biggest result is the drastically reduced pricing of today's streaming services from every quarter of the streaming media industry. 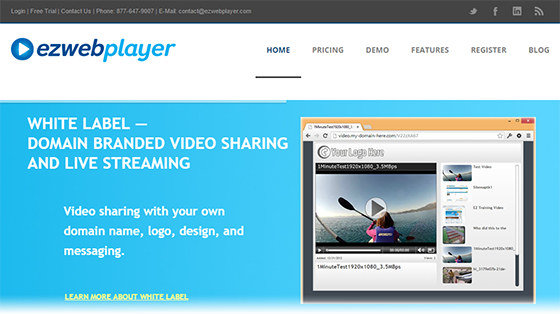 So now, instead of having to hire expensive coding programmers to create your custom branded video player, individuals, and small to medium sized businesses can simply use EZWebPlayer's white label player and insert custom branding everywhere around the web facing video products. Even the URL up in the browser has your domain, not ours. That allows you to reserve your expensive custom programmer for more design hours spent on your actual web site, not the mundane details of just the video module.